AYCE. Or, All You Can Eat, for those not yet acclimated to the now-oft-used acronym. (You late-comers and non-Korean BBQ-grubbers, you.) But we’re not talking Old Country Buffet on this blog, nor the club tunes-pumping Manna, here. We’re talking gourmet all you can eat, now. Take Roy Choi, for instance. 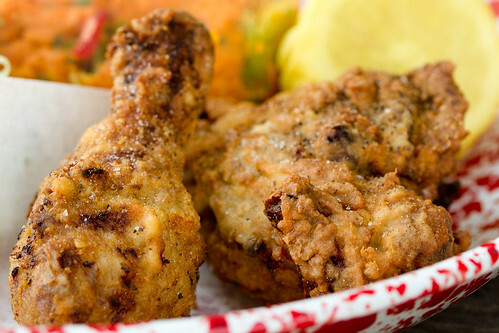 The All You Can Eat Fried Chicken Picnic starts tomorrow on Saturday, July 14th and will go every weekend from 12-3 PM. If you prefer the Korean beer of choice to wash down your poultry, add $10 for endless Hite. 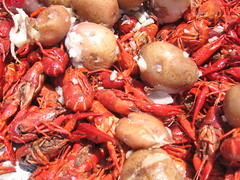 If you’re more of a shellfish and Zydeco band lover, head to The Foundry on Melrose for Crawfish Boil Sundays. Also offered are Hurricanes for $10 each and Jack Juleps (Jack Daniels with mint & sugar cubes) for $8. Each week, a different Po’ Boy will be featured (this week: catfish) for $9. All this, hosted by Chef Eric Greenspan, is of course one of the best ways to spend a summer Sunday on Melrose. This entry was posted in Food, Melrose, West L.A. and tagged A-Frame, all-you-can-eat, AYCE, chicken, crawfish, Eric Greenspan, fried chicken, po boy, Roy Choi, The Foundry on Melrose, West L.A.. Bookmark the permalink.